ROCHESTER – At first, Sabres prospect Matej Pekar thought he was just being soft when he skated off the ice after getting leveled Jan. 10. Then Pekar, who was in the midst of a standout rookie season with the Barrie Colts, looked down at the puck. “All of a sudden, I get blindsided from the third guy coming off the back check,” the winger said. When Pekar got off the ice, the severity of the injury finally hit him hard. “I was telling my trainer, ‘Yo, Jimmy, I can’t lift my arm, I don’t what’s going on,’ ” he said. Colts trainer Jimmy McKnight informed Pekar that the hit from Sudbury Wolves defenseman Liam Ross broke his collarbone. That’s when Pekar, 19, said he “absolutely lost it on the way to the locker room” and screamed. “I was absolutely devastated, to be honest,” he said. The Czech Republic player's first Ontario Hockey League season was over after only 33 games. He soon came to grips that he couldn’t do anything about the injury. “I told myself, ‘I can’t control it … can’t be really crying over that,’ ” said Pekar, whose team missed the playoffs without him. After about six weeks, he said he started feeling OK again. These days, Pekar, a fourth-round pick in 2018, 94th overall, is learning the ropes of pro hockey with the Rochester Americans. After Barrie’s season ended, he joined the Sabres’ American Hockey League affiliate last week to continue his development. The early plan is to have Pekar do off-ice work and join the Amerks on the ice following practice to work on his skills. He did, however, participate in Friday’s morning skate and fill in for winger C.J. Smith during Tuesday’s practice. Off the ice, Pekar is working to finish his senior year of high school. Whether Pekar plays games with the Amerks will be determined later. A mix of skill and tenacity has helped Pekar develop into one of the Sabres’ top forward prospects over the last nine months. Just days after the draft, his agitating style started earning him attention during Buffalo’s development camp. When he arrived in Barrie, his “desire to compete and get better” endeared him to his teammates, coach Dale Hawerchuk said. “He’s an Energizer Bunny,” said Hawerchuk, a Hall of Fame center who spent five of his 16 NHL seasons starring for the Sabres. When the Sabres picked the 6-foot, 180-pound Pekar, he planned to play college hockey at Miami University in Ohio. Then he decided to return to the United States Hockey League’s Muskegon Lumberjacks before choosing Barrie and the Ontario Hockey League. 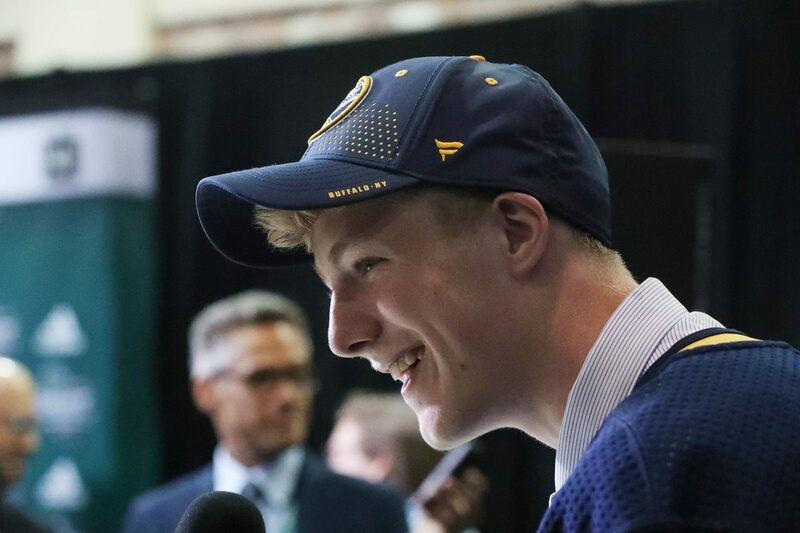 After Pekar played 10 OHL games, the Sabres signed him to a three-year, entry-level contract. He compiled 14 goals and 36 points with Barrie, averaging 1.1 points per contest. Hawerchuk said Pekar possesses the talent to morph into a dominant OHL player next season.